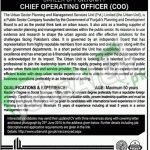 Here in the following i am going to showcase a job opportunity from Urban Unit Lahore Jobs 2016 Govt of Punjab For Chief Operating Officer. The Urban Unit is the Public Sector Organization which is established by the Govt of Punjab and is related and engaged in the works of planning & management of the urban side challenges and finding their research solution and is involved in many multiple tasks with respect to its work is recently seeking to hire the dynamic, energetic, full confident and high profiled applicants are required to apply for the vacant situation of Chief Operating Officer who have to deal with the number of the responsibilities as Assist the CEO and Board to devise a strategic plan for the next phase of the units development, Write and submit reports to the CEO about all matters, Look after daily operations of the company and the work of Specialists/ Sr. Specialists/ Experts/ Task leads and many more responsibilities are required to be hold by the applicants. The applicants will be given market based salary packages on the basis of their expertise and qualification. So, after having these details its turn to have another details next below. Educational & Experience Requirements: For all those applicants here the educational criteria there to apply which includes Master's degree Social Sciences / MBA / MPA or any other equivalent education is required from a reputed and well recognized foreign university along with 15 years experience in the relevant aspect and 5 years expertise in a senior management role. Beside this the applicants must possess the skills also which includes excellent communication skills, proven leadership qualities and should be strong player. Preference will be given to the such applicants who posses the international urban planning and management expertise. Age Limit: Age of the applicants should be 50 years maximum. The applicants who are willing to apply if they fulfill all the needs of the job as written as same are required to apply by sending the CV, containing 3 references and covering latter along with a fresh passport size photographs should reach at the said address. Last date for applying is 29th June 2016. The individuals are required to mention the name of applied post on the top of envelope. Only eligible, skillful applicants will be appointed. So stay tuned with JobsAlert.pk for more excellent jobs forever. Address: The Urban Unit-503, Shaheen Complex, Egerton Road, Lahore.